Vibrant Gujarat - Surpassing all Expectations! We all know how Narendra Modi welcomed the Tata Group to set up a commercial production unit for Nano in Sanand near Ahmedabad; after a violent Singur protests forced closure of their automobile factory in West Bengal. This investment opportunity worth Rs. 2000 crore was promptly spotted by the Gujarat Chief Minister Mr. Modi and is now being hailed as the fastest executed project in the history of the Tata Group, built in a record 14 months. That’s the reason as to why Gujarat attracts the cream of Indian industry to come together for the ‘Vibrant Gujarat Summit’. 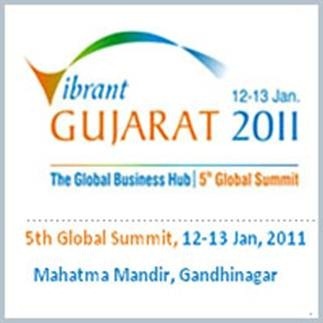 The on-going 5th edition of Vibrant Gujarat 2011 is no different. The summit has seen most of the top names of the Indian industry – be it Ambani brothers, Ratan Tata, Adi Godrej, A M Naik, Uday Kotak, Chanda Kochhar or Anand Mahindra – lined up to pledge investments in the growth-friendly state of Gujarat. This biggest deal-making jamboree of India, which would pale down even the glory of the recently concluded IPL player’s auction, saw 2766 MoUs for projects worth Rs.15 lakh crore being signed on the first of the two-day event held at Gandhinagar. Out of these, about 20% of the investments would entail in the power sector projects, 12% in the financial sector and 9% in mines and minerals. To put things in perspective, the pledge for this staggering investments notched on the very first day of the investor’s summit was far higher than the total investments (Rs. 12 lakh crore) promised in previous edition of Vibrant Gujarat Summit held in 2009. Starting with the Gujarat’s home-grown Adani Group, Gautam Adani showed interest in investing Rs. 80, 000 crore in ports, power and infrastructure projects. Reliance Industries proposes Rs. 50,000 crore worth of investments in green-field and brown-field projects. Sources suggest that Mukesh Ambani may also be interested in coming up with a new super specialty chemicals unit at Dahej. Anil Ambani-led ADAG will also invest Rs. 50,000 crore in Gujarat in next 5-7 years on various projects spanning from power plants to cement sector. The creator of Mumbai’s Bandra-Worli Sea-link, HCC, has evinced interest to invest Rs. 1200 crore to set up renewable energy project in Gujarat in next 2-5 years. Binani Cement has signed a MoU with the Gujarat government to set up 610-MV thermal power plant and a 5 mpta cement making facility at an investment of Rs.4200 crore. Ratan Tata has expressed interest in partnering with the state in providing transportation deep into the rural areas. The company already has a total investments in excess of Rs. 30,000 crore in Gujarat. On the 2nd day of the Summit, Mahindra Holidays & Resorts India announced the setting up of 7 new club Mahindra resorts in Gujarat at an estimated cost of Rs. 210 crore. On the last day of the Summit, the education sector in Gujarat has attracted a whopping Rs. 10,000 crores worth of investments entailing more than 90 MoUs. Less than half of these memorandums were signed in higher education segment. For sure, these Vibrant Gujarat Summits serve as role models for other states to emulate. TCS Beat Reliance To Become $100 Billion Company: 6 Facts You Should Know! This is an interesting article on education sector. Here is another one for the people from education sectore to explore new avenues/opportunities. This blog may not have a proposal but does have a scenario where a lot can be explored in education sector . i think its a little bit of jealousy in mr. Saurabh P. `s comments about gujarat. i had lived and worked in 4 different states of india and never seen the safety and peace people of gujarat enjoy over here. well, Mr. Saurabh`s all comments might be logical (but not true) in his mind, but one of the most successfull and admired businessman (read Mr. tata) when comes gujarat , with his nano, it must be something. after all it took him about 1000 crores to invest all over again to shift and rebuild the nano factory. Just consider one thing whenever we people (aam aadmi – the mango people ) go for buying our home or car we inquire like 100 times and check/cross check about prospected item`s feasibility/profitabilty and its future performances, just think How much considerations Mr Tata must have made and after zillions of calculations he must have chosen gujarat after burning his hands at singur. Narendra Modi is for real. I think there is a lot of hype about Gujarat. A whole section of cheerleaders in the media and a powerful PR machinery is taking a big lead in this. Much of the atcual investment figures in the previous years are doubtful with no hard evidence (anyone can say 40% is implemented). This year’s record MOUs are also suspect because apparenty 7000 MOUs got signed in less than 48 hours. Do the math. This is not to deny that Gujarat is progressing pretty well economically and that Mr Modi and Co have the good of the state in heart. But I suspect that this is well planned bubble that some powerful people are creating. And every bubble will burst one day. Myths about fantastic roads and infrastructure (in reality only in some limited places just like rest of India) modern cities (Ahmedabad looks no different than Paharganj or Noida) have become very common in media. In today’s Economic Times, the reporter even claims a 79% literacy rate for the state for a population from 2001 census. The misinformation (positive spin) campaign through the media is subtle but mind boggling. An enguiry commission needs to be set up to examine the actual status of all projects viz a viz claims on paper and who all are behind this bubble. Well none of the Indian states has witnessed such governance level in the past. So i believe it’s obvious that people outside the state would buy such rumors about bubble. Now you pointed out that development isn’t across state but limited to only metropolitan areas like Ahmedabad. Now you might wonder to know the place from where I’m commenting is an extreme end of not only Gujarat but India also which is mostly a rural area. Now this town Bhuj is has become role model for the world and is awarded best planned town award. Coming to rural part,till the border of India, I repeat till the border of India all roads are well constructed. Tourism industry has seen a four fold jump. You must have watched Mr.Bachchan adv. 24*7 electricity supply in a rural area n many rural schemes of state govt is undoubtedly benefiting ppl across through state. It’s a totally irrational to claim that only ahmedabad is progressing without checking ground reality. And I m totally amazed after reading that an enquiry commission needs to be set up on DEVELOPMENT. Well definitely let the ppl of this country know how state is progressing whereas our central govt is busy with scams and nothing is being inquired. As world has already known when Gujarat Govt received BEST GOVERNANCE award from United Nations. Anyway mate,I heartily welcome u to visit Gujarat once to check ground reality. And as amitabh says Kuch din to Guzaro humare Gujarat me. In fact, I am looking forward to Maharashtra for organizing such investor Summit. Let’s see… how many industrialists come forward to open up their plans for this otherwise-leading state. I am sure, even if Maharashtra offers half the number of facilities and infrastructure that Gujarat provides, Maharashtra could emerge as even bigger hit among the corporate world. But, for that, there need to be willingness on the part of the state. If Gujarat can do it, why not Maharashtra? Let’s keep infrastructural issues aside, even if Maharashtra lets go of its red-tapism that unnecessarily delays the implementation of projects and growth work; half the battle could be won over there itself. good governance is the hallmark of gujurath government’s initiatives. other states like TN, karnataka, andra, UP, maharastra should stand up and take notice. outside of mumbai and pune – there’s very little growth. same with andra where outside of hyderabad and vizag, the other cities arent too developed. Agreed! Governance is a key issue across the country including Metro cities like Mumbai and Delhi. The first Summit held in 03 had attracted 60k Cr and look today the figure has gone to 20L Cr ! ! Now many critics of NaMo and Gujarat argue that how much % of this translate into actual investment ? Well the national MoU conversion isn’t even 10% while according to Govt Officials claims that over 40% of MoUs have turned into real investment. So according to me anything which is >20% is a great great achievement. Even 1/4th of this MoU conversion bring investment worth of 5L Cr !! Agreed with your view. Though, the investment figures trickling in the form of pledges does sound a bit exaggerated; even if a part of this fortune is capitalised, the actual realisation will emerge as a good real ground work & pep-up to the state economy. Good governance is attracting lots of money of investors. Exactly! Good and transparent governance besides promptness shown by the Chief Minister to promote the trade and industry in the state has come out strikingly well. In fact, Gujarat is fast emerging as more than just business hub of India – spanning across education to toursim et all.